Throwing a baby shower helps mom-to-be get the things she needs and figure out what she still needs to get before the baby gets here. Depending on the mood swings of mom-to-be and the situation, throwing a baby shower can be stressful, but these tips for throwing a baby shower will make your life easier. Update: Since originally posting, we have put together 20 FREE Printable Baby Shower Games that you can print! Start planning early: Start planning early before it’s even remotely close to throwing the baby shower. Mom-to-be may change her mind several times on the theme of the shower. Make lists and keep the ideas in a safe place, so you can refer back to them. Create a budget for the baby shower: If you go overboard, a baby shower can cost way more than it actually should. Set yourself a maximum budget. If your budget is on the lower end, make your own invitations, party favors, or shop several places for the least expensive items. Send out invites early enough, but not too late in the game: Because people work on all days and all different hours, it is polite to give them enough time to either take off or change their schedule for the shower. A good rule of thumb is to send invitations out exactly 1 month in advance, so there is enough time to take off work, but not enough time to forget. 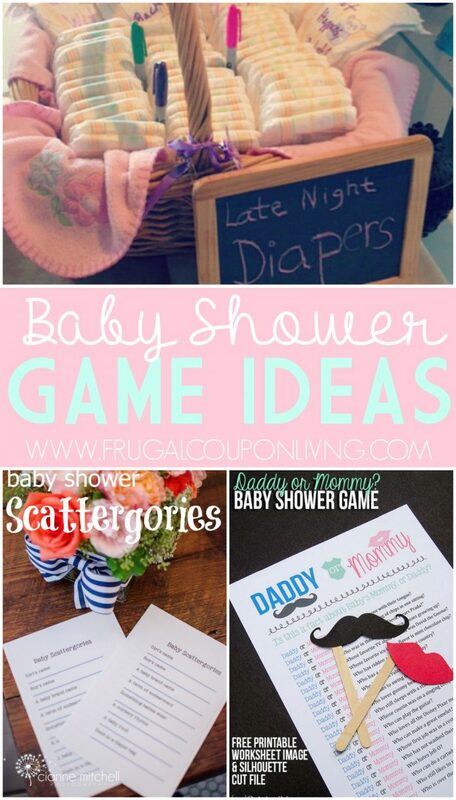 Come up with some creative games for the baby shower: There are tons of variations of baby shower games. A quick internet search is sure to bring you hundreds to choose from. Poopy Diapers: No one likes a poopy diaper, but with this game, your friends and family get to smell them and see what it “really” is. Melt different chocolate candies on different diapers and whoever guesses the right candy wins a prize. Guess the Mom’s size: This can be done my guessing mom’s actual measurement, or by using TP to count how many sheets around she is. The closest wins a prize. My Water Broke: Place a tiny plastic baby into your ice trays before you freeze your ice. At the beginning of the shower give everyone an ice cube to put in their glass. When the ice melts and the baby floats to the top, the first person to shout “My water broke,” wins a prize. Keep the baby shower focused on the mom-to-be: Make sure that in merry-making you focus everyone’s attention on mom-to-be 2-3 times during the shower. Remember, the party is about her and baby and she needs the support of everyone. Get help to clean up: Designate a few attendees to help you clean up at the end. You can have this planned early, or just ask people when they show up. The clean-up is much quicker and easier than the setup, but after a long party and lots of planning, it’s always nice to get some help. Create a cute theme for the baby shower: All baby showers need a theme. Let’s face it; the “it’s a boy” “It’s a girl” has been done a million times. Be creative with your themes such if mom-to-be has twins try “Jumping Monkeys.” If she is having a baby girl, try “Princess of the Womb.” For a boy, you could do “Spider Boy.” Always ask mom-to-be her opinion before choosing a theme. Ask others to help pitch in with food: You don’t have to be responsible for all the meal prep. If you are throwing the party, you need to be spending time mingling and making the party about mom-to-be. Especially with good friends, with your RSVP, ask attendees to choose what items they can help with, so you know you have food coming. Many of the expecting mother’s friends are wanting to do more, so this is a great way to incorporate their help. Planning a baby shower is no easy task, but with these simple tips, your baby shower will be a breeze. Remember, it’s all about mom-to-be not about how extravagant the party is. 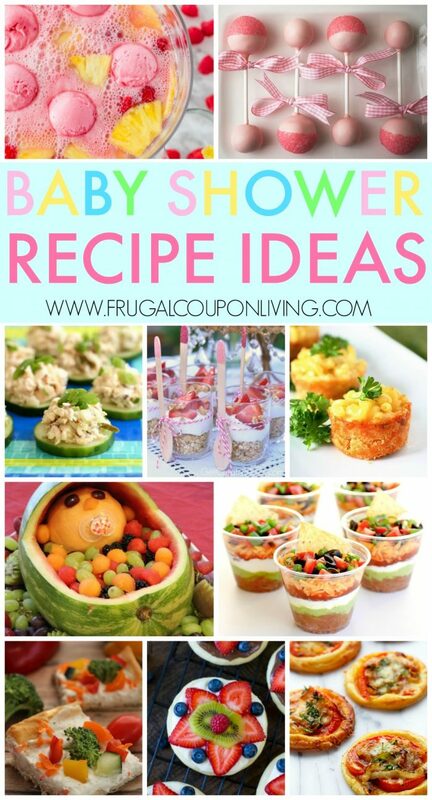 What other baby shower tips do you have? We’d love to hear them. 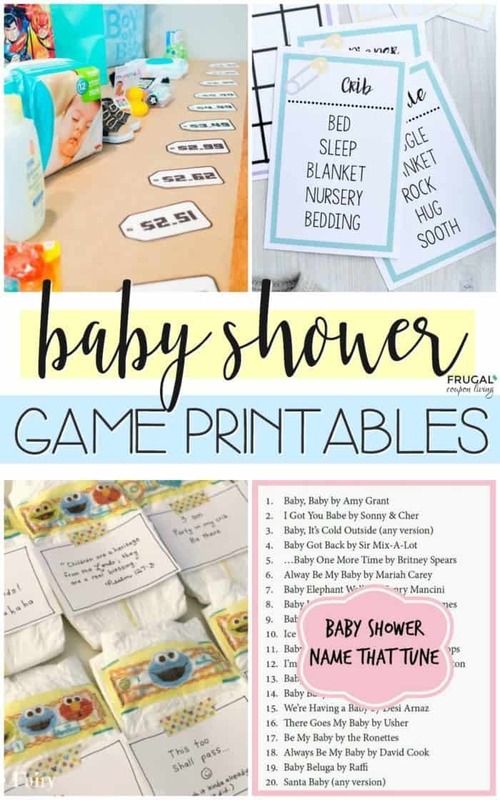 Also take a look at these Free Baby Shower Games Printables. Pin to Pinterest. Enjoy these New Mama Newborn Tips, Hacks, and Tricks! Pin to Pinterest. Tips for the First Trimester – Pin to Pinterest. Tips for the Second Trimester – Pin to Pinterest. Tips for the the Third Trimester – Pin to Pinterest. Tips for a Newborn (aka the Fourth Trimester) – Pin to Pinterest. Shopping for Baby? Check out these Baby Freebies on Frugal Coupon Living.